RED HOOK — A historic ship has found a new home in Red Hook and may soon be opening to the public for educational programs and events. The tanker, known as the Mary A. Whalen, has long been untethered, traveling from port to port on short-term permits, but beginning Friday, it'll finally have a home at Pier 11 in the Atlantic Basin — where it will stay for the next three years. 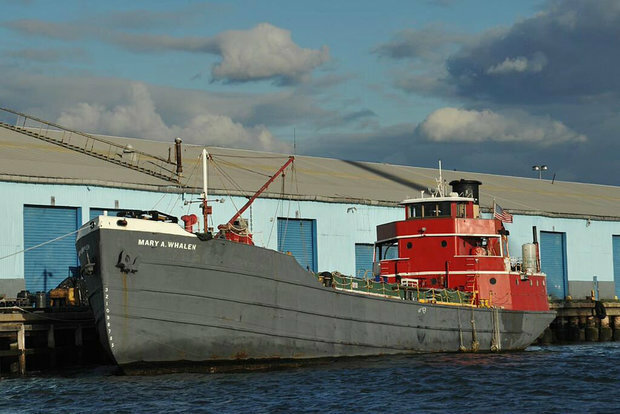 The 77-year-old ship, listed on the National Register of Historic Places, serves as the base for PortSide New York, a nonprofit maritime organization that operates out of the vessel. Mary A. Whalen has primarily been docked in the Red Hook Container Terminal, but has had to travel to other locations on short-term permits for public programs or repairs, according to Carolina Salguero, president of PortSide. PortSide, which is celebrating its 10-year anniversary this month, is planning a fundraiser as well as a weekend of public events, featuring tours, an evening concert, “maritime board games” and a community pot luck aboard the tanker. The date for the weekend has yet to be announced. This summer, the organization will focus its efforts on bringing more school groups and class trips onto the ship. The nonprofit plans to host open house events for educators from public schools and colleges to brainstorm programs that can be hosted on the Mary A. Whalen once the academic year begins, Salguero said. “We have done educational programs before… and we would like to expand those offerings,” she said. The open house dates are scheduled for June 7, 10 and 11, and teachers are encouraged to make an appointment before visiting. PortSide has already partnered up with Red Hook's P.S. 15 and the Williamburg High School for Architecture and Design for educational programming. Three students from the Williamsburg High School have scored internships aboard the ship this summer, according to a statement from the organization.